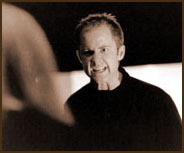 Billy Boyd (Scots) shot to fame as "Peregrin Took" in Peter Jackson's Lord of the Rings trilogy of films. A graduate of the Royal Scottish Academy of Music & Drama, his background is very much based on stage work. Which I found nicely ironic, as he first came to my attention in Coming Soon - a television mockumentary set around a touring alternative performance troup, in the role of "Ross", the enthusiastic lighting wiz. Billy has a great gentleness and wonderful comic timing. He has the sort of presence that makes you sit up and notice him, yet his performances are so generous that you feel he is a team player, only interested in the role and how it fits with the others on screen. This extends into his daily life, with his supporting programs for young actors in the Glasgow area, and his belief in encouraging the next generation of talent. Billy is an actor who you look forward to seeing on screen. He has a great talent and a generosity of spirit that shines. As an actor: His empathy, his generosity, his presence. As a person: His lack of self-absorption, his belief in supporting others.